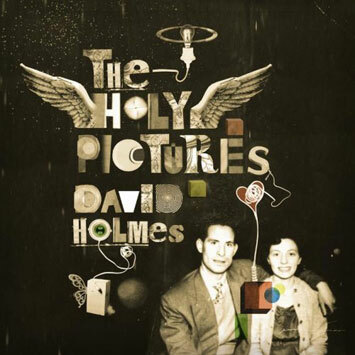 David Holmes is set to release his long-awaited fourth solo album through Canderblinks/Mercury/UMC, and The Holy Pictures is an album whose incubation has lasted almost the entire length of Holmes' career. To cut straight to Holmes' own words, “The story of this album really began on the 4th of August 1996, when my mother, Sarah Holmes, passed away. I had always wanted to make a record about my life in Belfast and all the things attached to that - family, friends, loss, love and starting a family of my own. All the stuff that shapes the person you become.” Personal themes as a basis for creative work proved to be challenging though, hence The Holy Pictures brewing for a period of over a decade while Holmes carried on with his eclectic and productive career to date. In terms of its musical direction, The Holy Pictures shares with Holmes' other work a rich and idiosyncratic fusion of influences. The first single, I Heard Wonders, (which will be released with a remix by Andrew Weatherall and flykkiller) calls to mind The Velvet Underground, Blondie and La Düsseldorf. David teamed up with Martin Rev from Suicide to write the lyrics for this track. Threaded through the rest of the album are myriad other influences - from the Jesus and Mary Chain on Story of the Ink, through the Soft Machine and the Beach Boys on Melanie and Hey Maggy, to Daniel Johnson,herbert henk and early Eno and Lanois on the beautifully haunting track The Ballad of Sarah and Jack. As well as Rev, The Holy Pictures features collaborations with Leo Abrahams and Jon Hopkins. The album was recorded in Belfast, which, given its themes, seems only fitting. The Holmes career that has played out in the foreground, while The Holy Pictures developed in the background, started with the release of 1995's This Film's Crap, Let's Slash The Seats, an album that plugged immediately into what remains one of his most enduring and vital sources of musical inspiration - cinema. Further commercial and critical acclaim came with 1997's Let's Get Killed and 2000's Bow Down To The Exit Sign, followed by 2003's David Holmes Presents the Free Association, the latter leading to a hectic spell on the road with the Free Association. After that, work commenced in earnest on The Holy Pictures. Alongside these releases came a successful partnership with director Steven Soderbergh, resulting in the soundtracks to Out Of Sight, and all three Ocean's films - Ocean's 11, 12 and 13. this year Holmes has also just scored a new Apple iPhone advertisement featuring Robert Downey Jr and directed by David Fincher (Seven, Fight Club. he also scored along side leo abrahams the winner of the camera D'Or at this years cannes film festival 'Hunger' directed by the great artist and turner prize winner Steve mc queen. He is currently working on 5 minutes of heaven directed by oscar nominee and director of the mindblowing 'Downfall' oliver hirschbiegel.and later on in the year 'Cherrybomb' directed by his life long collaborators and 2 of his best friends Glenn Leyburn and Lisa Barros D'Sa. Holmes can be seen doing his other love, DJing, during the festival season this summer. He will be at MC5 ..live @ the stiff kitten[18th july] earagail arts festival[20th july] [The Big Chill [1st -3rd August] nitza-barcalona-[9th august]The Green Man [15-17th August] flatlake arts festival[22nd/23rd august] and Electric Picnic [29th-31st August].